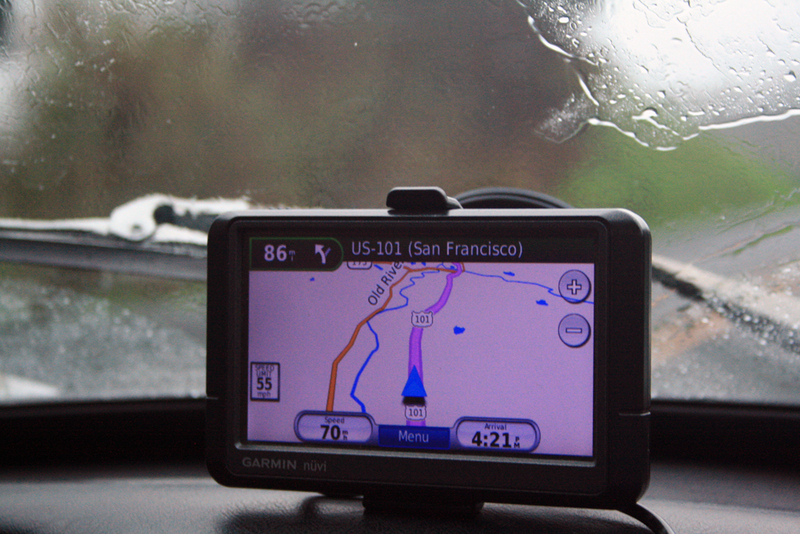 The rain continued on the second day of our journey which began in Fortuna, California and ended in San Francisco, about 250 miles. To begin at the end, here’s the money shot of the day. The sun had already set (although we hadn’t seen it all day, so it was hard to tell) and the rain had stopped. There was enough twilight to capture the perfect image. 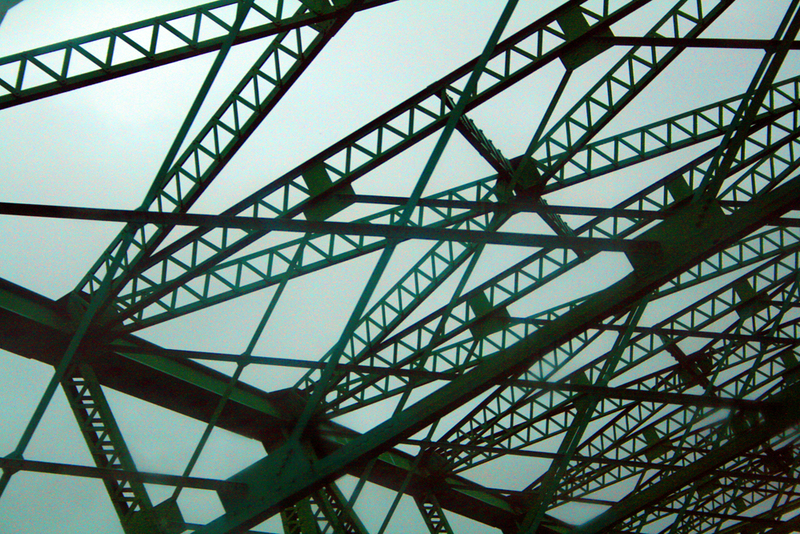 Many thanks to our location scout for this one, Mr. Avi Lasko. All of the Californians we spoke with were pleased as punch about rain. Northern California is now officially out of the drought, but the south still has a lot of catching up to do. The passenger side windshield wiper is not in top form. Googie spent about an hour with the guys at the auto parts store in Fortuna trying to get it to sit snugly aganst the windshield, but it would not cooperate. Goog chose not to change equipment in the middle of the game — better the Devil you know, kind of thing. We’re discussing the possibility of calling Moss Motors and having them ship a new set of arms to Phoenix so it will be there when we arrive. Haven’t decided on that point, yet. I don’t think it’s going to rain anymore for the next two weeks. Of course, if we do order a set of arms that will guarantee it won’t rain again. Other than that one little niggly point, the BGT is loving life. Googie says that she drives comfortably at 70 mph (as you can see from the GPS read out). The gas gauge seems to be accurate. 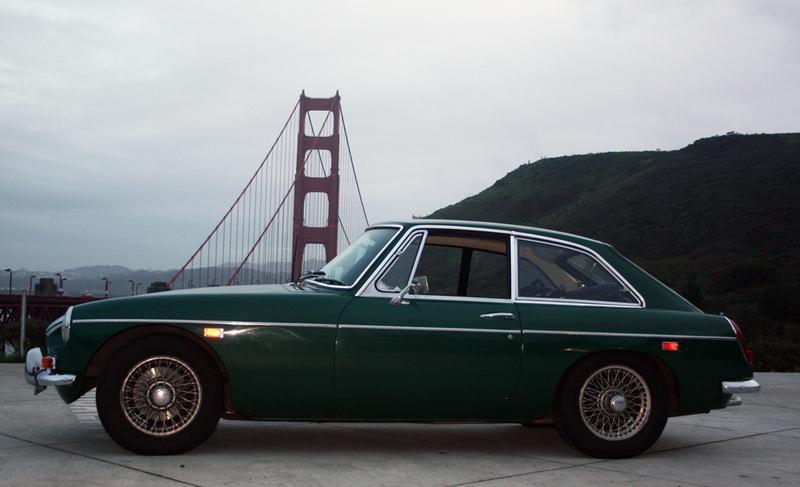 We haven’t determined the exact range (probably about 230 to 250 miles) or MPG yet. Another few days on the road and we should have the numbers down. I will report back. I satisfied myself with photos taken from inside the car. 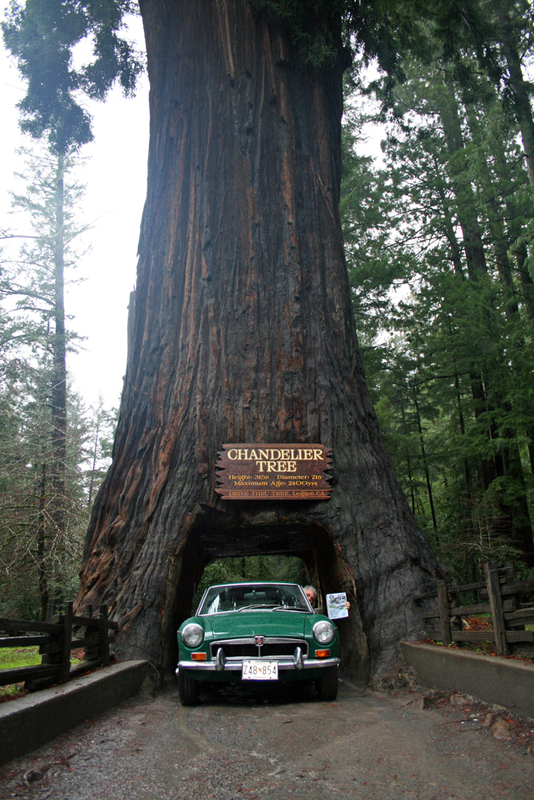 We continued our drive down the Redwood Highway, through the Avenue of the Giants and into wine country. This is the tunnel photo for the Moss Motoring Challenge. At lunch, we met a couple of pot growers. We learned that there is a certain number of plants an individual is allowed to grow. If the authorities find you with more plants than you are allowed, they just rip out the “overage.” I wonder if they give the “overage” to somebody who doesn’t have their allotment of plants. 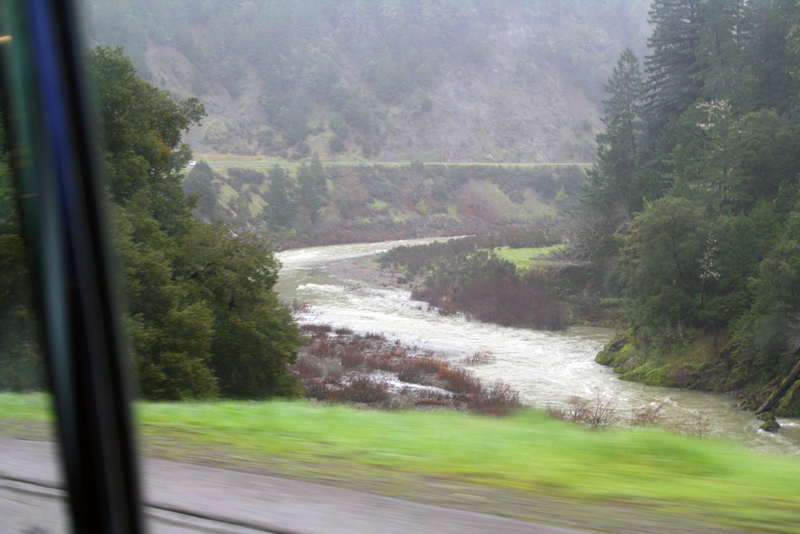 We continued down US-101 and into Sonoma County along the Russian River. 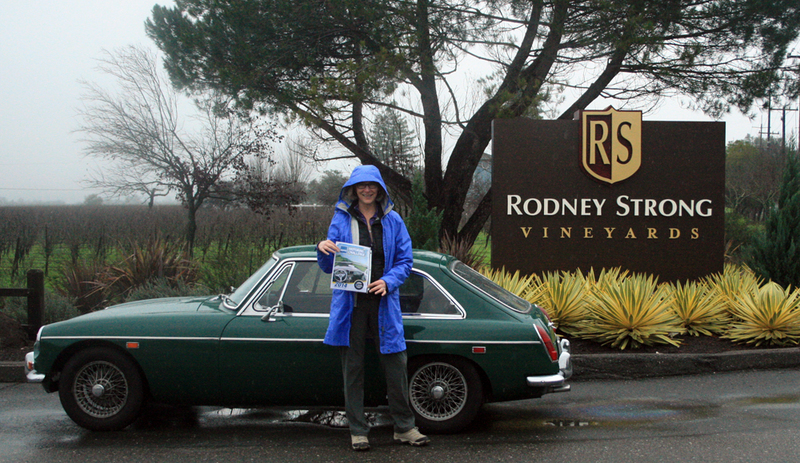 Traveling through wine country, we hopped off the freeway to secure another shot for the Challenge. We did not stop to drink. Moss Motors is very clear in their challenge guidelines that we should always be safe when gathering images. Driving after drinking wine is something Goldmans would never do. A vineyard — one point on the Moss Motor Challenge. We moved into civilization by the end of the day. 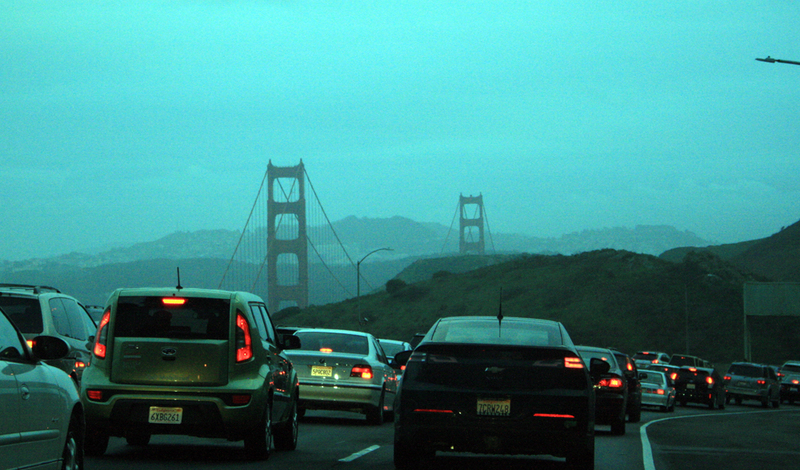 Traffic going into San Francisco. The sun is burning off the fog in San Francisco and it looks like we’re going to have a beautiful day with family and friends. Next stop — Bakersfield. Check back for an update in two days. Looks like you are loving very minute of your journey. Stay dry and have fun. Say Hello to Jane for us. Maybe this will be the end of the rain and the balance of the ride will be dry. Best we could do. The lower part of Conzelman Road was closed yesterday. Hi travelers- Was talking to Renee and she would like to be on your blog. I entered her E mail on your blog, and hope it went to you. Put her on your list if it did not go through. Your rain from day two is now in Balto but it is much colder than Calif. Have fun – Keep the wind behind you. Can’t wait to go for a ride in the green machine.